A GREAT PLACE FOR GROUP OUTINGS FOR 10 – 400 PEOPLE! Ask about how to reserve the entire park for a private event! Plan your next group outing at Bogeys Sports Park! 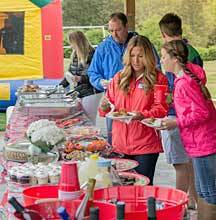 We have experience hosting corporate outings, team builders, church groups, family reunions, school parties, sports teams, birthday parties and more. We can handle your birthday party with as few as six children or close the park for a private event of up to 400 people, and everything in between. Events of up to 24 people can be held at either of our two Patio areas. Anything larger can be hosted at our top notch pavilion with seating for up to 125 guests at once. There’s also room for inflatables! If you’re looking for a great, family friendly place for your outdoor event, look no further.